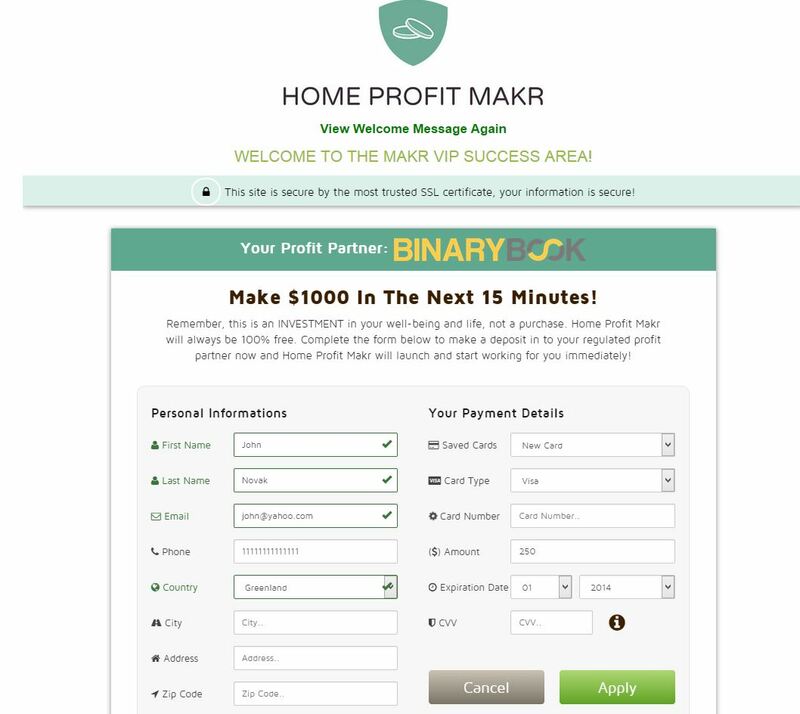 Today we are going to review a new idea of binary options scammers, they used it with “Home Profit Makr”. All binary options scams are made by affiliates who earn commissions when you open a trading account with them. But scammers find different ideas to persuade you that their project is something different. And here is where Home Profit Makr brings something new. They say that they developed a binary options trading software that will generate you thousands of dollars for free. They say that they developed it thanks to a crowd funding project with over a million raised. Lies as always, but this one is at least original. Home Profit Makr authors say in their video that you received a special licence and security tokens, to make you feel special, it is the usual trick of scammers. But revisit when you want even from a different computer and you will always see the same video. The reality is that it is all a big lie, there was no crowd funding project for Home Profit Makr and this software won’t make you any money on binary options. As we already mentioned, they just need you to open an account and deposit money, because that will earn them affiliate commissions. The usual bottom line is that if you want to make money on binary options, you have to trade them yourself, nobody will do it for you for free. Binary options require patience and learning before you can start making money with them. I have a deposit for over600dollars. I would like to withdraw 500 dollars for my purchases that I need from my employment by law my funds cannot be held without my approval and that is what is happening.I am in need of these funds. If possible they can be safely deposited in PayPal, I have an account with them. Hi, contact the broker that you sent your money to and ask for a withdrawal.